Laying the foundation of your home is arguably the most important stage in new construction; it is, quite literally, the bedrock upon which your house sits. For this reason, it’s important to understand the best foundation system for your geographic location, needs, and architectural preferences. For most regions with consistently warm weather, slab foundations, often referred to as “floating slabs” are the most common foundations poured. However, for colder climates, this kind of construction causes homes to be more prone to pest intrusion, flooding, and weakened structural integrity, as well as higher heating bills for homeowners, as the floor is often chilly during the winter months. Because of this, many people who live in colder climates choose either a crawl space or a basement. Crawl spaces have several advantages over slab foundations, especially in harsher environments. Unlike slab construction, ductwork, electric, fuel lines, and plumbing can be run through a crawl space for easier access and service. In addition, crawl spaces can help create a buffer between your flooring and the ground which helps to insulate your home (especially if high-quality insulation is used during construction). However, crawl spaces often have problems with dampness, which can lead to mold growth, poor air quality, and in worse-case scenarios, structural damage. Finally, there are homes built on a basement foundation. All of Maleno’s homes don this type of construction for its many advantages over slabs and crawl spaces. One of the first benefits is obvious: basements add more livable or storage space to the house, finished or not. While there can be issues with moisture (more so in block construction), often, the temperature in a basement stays more consistent through the seasons. It’s also far easier to make repairs to plumbing, gas lines, electric, and ductwork (and cheaper if you call a technician) in a basement than working on your back in a crawl space or, worse yet, digging into slab concrete. Moreover, with the right construction, a basement will save you hundreds on your gas bills. It’s a fact that hot air rises, yet paradoxically, it’s also true the lowest room in the house can take a toll on heating bill. Case in point, according to House Logic, a homeowner’s resource created by the National Association of REALTORS®, as much as 30% of energy loss can occur from the basement. With proper construction and insulation, Energy Star found that most houses in the North Eastern United States will save 12-14% on their utility bills. When considering the savings in energy costs, it’s easy to understand why quality building materials are so essential. Maleno is adamant about building the best homes possible. To do so, we follow a simple equation: create an amazing team and use only high-quality building materials. 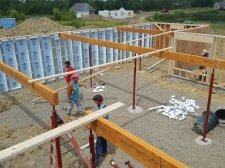 Our team uses Superior Walls products for nearly all of our foundation systems. Not only is this material more structurally sound than traditional block, but this precast-concrete product is energy friendly, environmentally friendly, and moisture minimizing. Superior Walls products are National Green Building Standard (NGBS) certified which means our home-building processes are easier on the environment as the materials themselves are eco-friendly. For instance, our foundation construction is carefully scheduled in order to minimize soil exposure, which prevents erosion. Moreover, Superior Walls products source regional materials for their building components and demonstrate “exceptional energy performance,” that exceeds the performance of an Energy Star home. Speaking of Energy Star, homes that are in accordance with the International Energy Conservation Code (IECC) are generally 15% more efficient than those that are not. In additional to conservation, Superior Walls are also important for air purity. Because we use 5000 psi concrete with a lower water-to-cement ratio, our foundations can help prevent the transfer of moisture through basement walls. Dry basements ensure a higher air quality by minimizing mold that is often found in traditional block basements. From conception to fulfillment, Maleno takes pride in the construct of our homes. Through our exceptional team and the environmentally-friendly and energy-saving building materials used during our construction, we build foundations that will last a lifetime. If you’re interested in contacting Maleno about your custom home, simply click here or call 814-833-6516.